Don't Feel Like Reading? Here's A Summary Of The Milwaukee Cordless Drill Review. This Milwaukee cordless drill has an extremely fast two-speed transmission with a very high RPM. The battery life of this Milwaukee drill is extremely high and is fully recharged in 30 minutes. The 2407-22 model is compact and incredibly lightweight and has an ergonomic rubberized hand grip which gives you a lot of handling comfort. It comes with a 5 year warranty on the drill and is a must have tool for any professional contractor. A lot of homeowners these days are focused on carrying out their home improvement projects them self. And the best way to implement your projects more conveniently is by choosing an essential tool. One thing that every homeowner should not lack in their toolbox and that is a cordless drill. In fact, most of the time you will not hire a carpenter or a professional maintenance specialist to do small construction jobs in your home. Furthermore, there are so many guides and do-it-yourself tutorials or videos you can find on the internet today, which can help you carry out simple home repairs, and with a cordless drill, this power tool can be of immense help to you. Cordless drills are becoming more and more one of our favorite tools, and most DIY love them since they are incredibly easy to use plus they don’t take much skill to use. The exciting part is that with just a little push and proper positioning, you will achieve the result that you aim for. However, with significant powerhouse brands such as Black & Decker drills and Ryobi power drills, brands such as Milwaukee, which are evolving are often disregarded. But Milwaukee products are becoming popular, and most users are delighted with the extraordinary quality these power tools deliver. If you are a professional or a casual DIYer looking for a long-lasting, high-quality, compact power drill/driver set, then you should definitely consider Milwaukee. A lot has happened in the cordless drills world, and most notably, there are so many cordless drills out there in the market, making it quite tricky to choose the best cordless drill that meets your needs and budget. The question remains: "I’m looking for a cordless drill, what do you recommend? " Well, this is where we come in, and our answer is a little different. To make your life easier, we have prepared a detailed Milwaukee 2407-22 M12 review just for you. This cordless drill from Milwaukee is a very compact drill/driver which enables for optimal handling in tight and enclosed areas. This power tool is incredibly lightweight that ensures less fatigue when carrying out any drilling job at home or on a job site. This product features high torque and speed which allows maximum performance and incredible drilling and driving results. It has built-in LED lighting which illuminates dark workspaces. In this Milwaukee 2407-22 M12 review, we will be providing all the information about the features of Milwaukee 2407-22 M12 cordless drill you need to make a buying decision. We will also be looking at the pros and cons of this powerful tool - this for you to acquire adequate knowledge to make your selection. If you need a beast on your side that is not overly priced to handle the toughest tasks at hand, then the Milwaukee 2407-22 M12 3/8 Drill Driver Kit is a must-have. Most people love using, Milwaukee products since they are of top quality and the customer support has always been exceptional, and this cordless drill in the M12 series is no exception. This drill driver can drive a hole through a brick like a hair comb running through your hair. One of the advantages of a cordless drill is that it frees you from the cost and waste of disposable batteries. But a cordless power tool is only as reliable as the battery it features, and that is where the M12 Lithium-Ion batteries come in. This cordless drill from Milwaukee comes fitted with two red lithium-ion batteries which allow extended periods of working. You can definitely trust the 1.4 amp-hour lithium-battery which powers the Milwaukee 2407-22 M12 to deliver long runtimes and fade-free power. Furthermore, lithium-ion batteries provide extended battery life, thus saving you a few bucks by avoiding replacements. Another thing we really liked with the Milwaukee M12 series is the charge time. It takes less time for the battery to be fully charged: with the Milwaukee lithium-ion charger, you can load your battery in less than 30 minutes. This allows you to keep working in between charges hence maximizing your productivity. As a craftsman, one thing we usually consider in a power drill when purchasing one is the level of torque it offers; that is if we want to diversify our work capabilities. 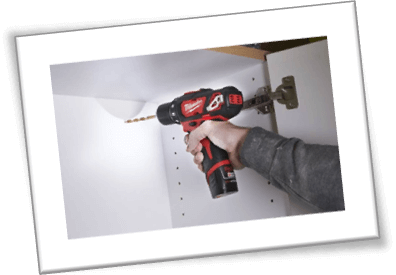 And the Milwaukee M12 drill driver manufacturer knows this – the drill driver is capable of delivering up to 275 inches per pound of torque, which is 25% more than the comparable models, for quick and efficient results when driving small fasteners. The impact driver provides a best-in-its-class 850 inches per pound of torque. So, if you’re working on heavy-duty driving or drilling projects, this beneficial feature comes in handy. With this Milwaukee cordless drill, you can easily drill and fasten objects within the minimal time possible, thanks to its no-load RPM feature. It is estimated to be about 35 percent faster than many other power tools in its class which has an all-metal locking chuck. This cordless drill will significantly increase your efficiency when working on big projects. The Milwaukee 2407-22 provides a two-speed transmission: at low gear, it can reach 0-400 RPM speed, while at high gear, it can do 0-1,500 RPM in just a matter of seconds. When it comes to handling heavy-duty tasks with difficult job site conditions, the Milwaukee 2407-22 is an excellent option. This Milwaukee M12 drill is the only power tool in its class with 100% metal 3/ 8-inches single-sleeve ratcheting and locking which ensures supreme durability. The ratcheting locking feature typically bites into the bit, which makes sure that the bit holds in his place. The Milwaukee 2407-22 M12 is one of the lightest 12volt cordless drills available on the market, weighing only 2 pounds. Combined with the built-in LED lights, it becomes incredibly easy to maneuver even in tight or enclosed spaces without getting tired. The overall size of this Milwaukee power drill is compact, but do not think that it is not powerful enough for everyday applications. Moreover, both the clutch ring and gearbox are made of cast aluminum. The drill’s main body is made of a sturdy red ABS-based plastic with over half the body of the device covered in black-rubber over-mold. Additionally, the forward/reverse switch is nicely situated. Additionally, nothing is more frustrating than running out of battery while in the process of drilling. And not only is this annoying, but it can also entirely strip the screw or even damage the surface you are working on. To help combat this scenario, this quality Milwaukee cordless drill comes fitted with an on board battery gauge for displaying the remaining battery life at all times. Therefore, ensuring that you never run out of battery while drilling or driving ever again. Sometimes we find ourselves drilling the whole day, only to find out the project was way too big so that it couldn’t be finished before dark, so we are forced to work in the night. Also, there are some projects which force us to get into musky dark corners. What do you do in such scenario? Well, Milwaukee power tools come fitted with a LED lighting for increased visibility. This feature is beneficial – you can efficiently illuminate your work space hence making your drilling much more accessible and ensures accurate results. Everyone who works with power tools knows that accidents happen and that the drill can become easily damaged. Thankfully, the Milwaukee 2407-22 M12 comes backed by a quality five-year limited manufacturer warranty to protect the consumers from any defects of workmanship or material. The M12 Red Lithium batteries are backed by a two-year limited battery warranty. If properly cared for, this astonishing Milwaukee cordless drill set will offer you incredible performance and results for quite a long time. The battery takes less than 30 minutes to be fully charged. The battery life is extraordinary. Two-speed transmission for drilling and driving applications. LED lights illumination makes it possible working in dark areas. Battery gauge feature ensures you never run out of juice again. Extremely fast – No load RPM rates increases your workflow efficiency. Comes with a five-year limited warranty on the tool and two-year warranty on the battery. Not powerful enough for heavy-duty drilling/driving projects. The transport box is heavy. For those who work long shifts, we suggest you buy an additional battery extension to prevent having to wait for the batteries recharging. And if you want your batteries to last for a long time, we recommend always to remove the battery from the charger when it is fully charged. Also, if you are not using your drill driver, it is good to remove the battery. You can buy many top drill bits without any challenge, thanks to its 3/8-inch drill bit size. The impressive part is that you can quickly place your drill driver on your tool belt, thanks to its compact and lightweight nature. 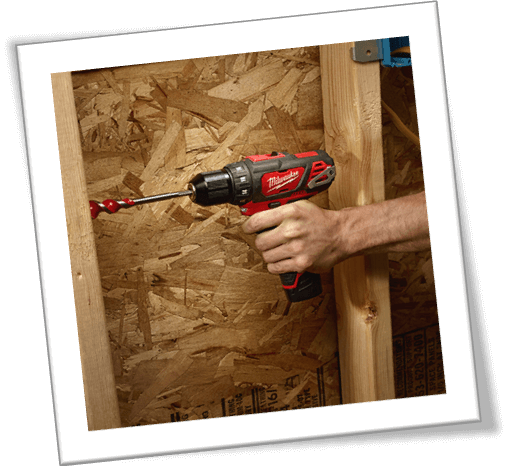 If you are looking for a lighter-duty drill driver to keep around the house for regular fixes and maintenance, then you should surely consider the Milwaukee 2407-22 M12. It is regarded as a professional grade 12-volt drill, so if you are a contractor or handyman who spends most of your day tackling light to medium-duty drilling work, then this Milwaukee cordless drill is the best buy. Still not sure which cordless drill to buy? Make sure to check out our cordless drill buying guide or compare the best cordless drills on this page, hope this helps you make an informed decision.